Last Friday the Sweet Zephyrs played Durham's newest venue -- [no, not the Bull City Headquarters] -- the the Markham and Glendale traffic circle in the Duke Park neighborhood. Traffic slowed down but was unimpeded by the 30 minute recital (which is, I guess, what the traffic circle is supposed to do under normal circumstances). One car passed by on the left, maybe because the Quintet has just played something by a British composer. I'd never heard this group until Friday, but you should know that they're quite good, and fun: their last two pieces were "Rubber Ducky" and the theme from Monty Python's Flying Circus. 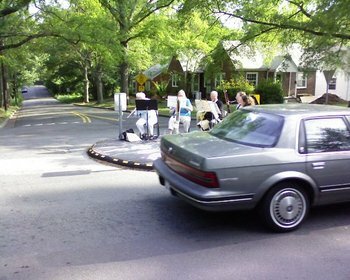 One car passed by on the left, maybe because the Quintet has just played something by a British composer. The Monty Python theme was known as "The Liberty Bell March" by John Philip Sousa in its previous incarnation. That traffic circle is incredible. Being just two blocks away, I keep thinking I need to get involved, but I keep forgetting. Then I drive by on Sunday and see them gathered for "church" or whatever. Other times, it's like, space aliens have left a new landing module there. And wasn't there a time when some dog was chained up outside, neglected, and the traffic circle responded by putting in a statue of a dog with multiple chains around its neck, and the owner of the neglected dog got the message? Speaking of getting the message, I dreamed last night that I told John Bolton, in person, that he needed to watch the Daily Show because the Iraq war is stupid. The chained dog was designed to call attention to proposed legislation making the continuous tethering of dogs illegal in Durham and Orange counties. I'm kinda embarrassed at not going to and blogging this, because I live right there! Sousa, huhn? I oughtta be embarrassed. But I'm not. But Joe REALLY should be. I noticed afterward that his car was in the driveway, which suggests that he was home, and you'd think he would have heard all the commotion -- I mean, what is, he deaf or something? Oh wait. Deaf. Right. Barry and I should have knocked. Now I'm the one who's embarrassed. No, but wait -- Joe would have gotten the neighborhood announcement, right? And should have seen Barry's post, right? OK. Embarrassment back to Joe.